H.14115 – This Gordon Drive estate is the pinnacle of beachfront luxury living comprising over 1.5 acres and more than 150 ft. of direct beach frontage. Magnificent panoramic Gulf views from nearly every vantage point! 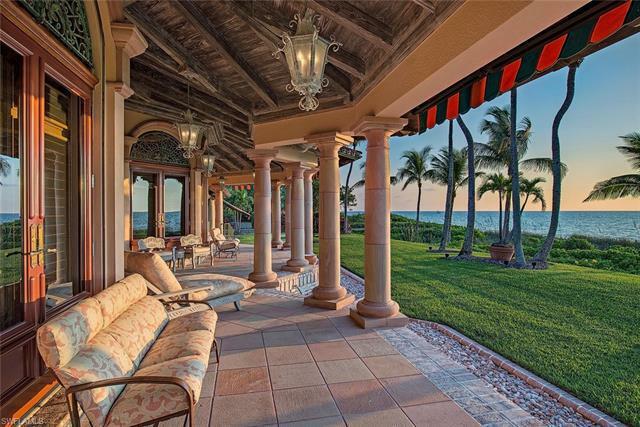 This sprawling estate offers just under 5,400 Sq.Ft. of living space featuring gorgeous custom stone, marble and wood flooring, detailed Artisan Guild custom millwork, exquisite chandeliers, multiple intricately carved marble and stone fireplaces, a gourmet kitchen and upgrades throughout. Luxury and lifestyle redefined! Spectacular, park-like grounds with meticulous landscaping, lush, tropical foliage and fish ponds create a haven for indoor and outdoor entertaining! Many distinct areas for gatherings, all with Gulf front beach access and mesmerizing views. Truly a remarkable slice of Naples finest neighborhood. The Real Estate Listing information for MLS 219004319 comes from the cooperative Broker Reciprocity Program in Florida. The Broker Reciprocity Program Icon is shown for all Broker Reciprocity Program Listings and the Detail Page includes the name of the participating Listing Broker. The real estate at 2050 Gordon Dr Naples FL 34102 may not be the only available Broker Reciprocity Program Listing in the community and Sun Realty may not be the Listing Brokerage. Information herein deemed reliable but not guaranteed or warranted and should be checked for accuracy prior to engaging in any transaction. This website indicates one source of ‘Market Value’ and we suggest that you look at several other sources to get the best idea of the Real Estate Market Value before entering into any real estate transaction. If you have questions about the value shown please contact Collier County Property Appraiser.